Stay oil free without the shine! For girls with oily skin, the mere idea of slathering on sunscreen may sound uncomfortable because of how it can tend to mix with facial oils. However, skipping the process only does more harm than good. Ditching the sun protection makes the skin prone to environmental aggressors such as the sun’s rays and pollution, which could lead to bigger skin problems than oiliness. Look for sunscreens with oil-free labels. These products do not have the greasy or tacky feeling regular lotions give and help retain water in the skin. Also go for products that contain Niacinamide (to boost your skin’s immunity and regulate oil flow), Retinol (to make pores tighter and emit less oil), and Monolaurin (to regulate the amount of sebum your face produces). This may sound counter-intuitive but having oily skin does not mean you can skip moisturizer. Remember that oil is not moisture, and that you want glow, not grease. Check if your sunscreen contains Hyaluronic acid, a hydrating ingredient that’s lightweight enough, so it’s perfect for oily and acne-prone skin types who are averse to oily or creamy moisturizers. One way to steer clear from possibly harmful chemicals is to make sure your sunscreen is fragrance-free. Artificial fragrances usually contain irritating (and sketchy) ingredients that can clog the pores that may eventually lead to skin breakouts or skin irritation that may only make your oily situation worse. Sunscreens that feel like the union of oil blotting papers and matte foundations are the savior to those with oily skin types. Products with a matte finish can be worn alone or under makeup while keeping oiliness at bay. 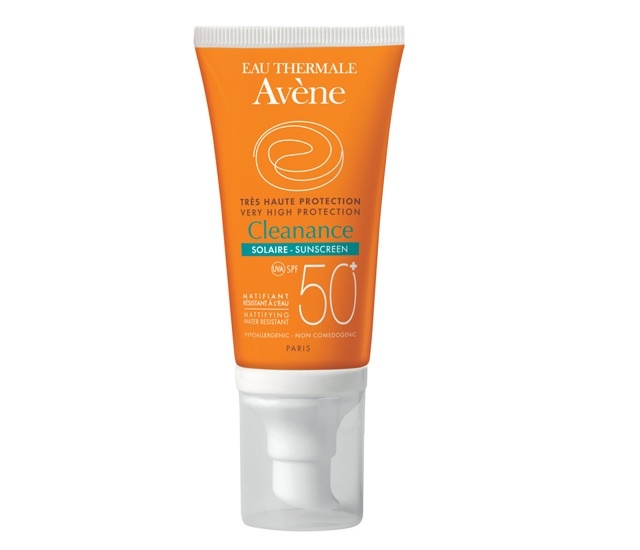 One good option is Avene Cleanance Solaire Sunscreen. This French brand's version is infused with antioxidants, vitamin E, SPF 50 and the Avene’s famous thermal waters to keep the skin protected and glowing. Not only does it provide a dry, mattifying feel, it is also hypoallergenic and non-comedogenic (non-pore clogging), so it also gets along better with spot-prone, sensitive, and dry complexions. For more information about Avene, check out their Facebook page here. This article was created by Summit StoryLabs in partnership with Avène.